One of the disappointing aspects of Mutant: Year Zero – Roleplaying at the End of Days is that it limits the types of characters that the players can choose from. In ‘traditional’ and more familiar—if slightly gonzo—post-apocalypse roleplaying games, the options include pure strain humans, mutant humans, mutant animals, and mutant plants, but in the Swedish roleplaying game originally published by Free League Publishing and published in English by Modiphius Entertainment, the only option is the mutant human, or simply, the mutant. 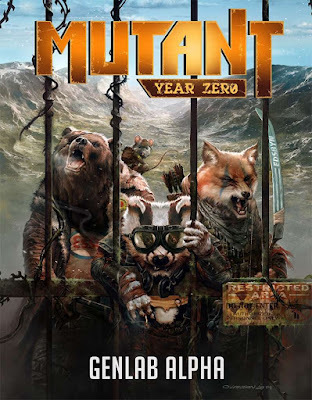 That changes with the release of Mutant: Genlab Alpha, which is either a roleplaying game and campaign of its own or a supplement to Mutant: Year Zero, depending on how the Game Master wants to use it. Mutant: Genlab Alpha adds anthropomorphic animals to the setting of Mutant: Year Zero and supports their addition with a campaign that can be run prior to—or parallel to—the campaign outlined in Mutant: Year Zero – Roleplaying at the End of Days. Or the Game Master can simply ignore the campaign and use the book as a supplement to add the animals to his campaign from the start. Published following a successful Kickstarter campaign, just like the forthcoming Mutant: Mechatron - Rise of the Robots Roleplaying, the setting for Mutant: Genlab Alpha and the campaign—‘Escape from Paradise’—is Paradise Valley, a valley high in the mountains, the high slopes covered in snow enough for skiing. The valley is closed off, entrance and exit prevented by a double electric fence. Within the confines of the valley can be found forests, rivers, swamps, lakes, islands, and more. It is inhabited by nine tribes, each consisting of a specific type of animal. These are the Ape, Badger, Bear, Cat, Dog, Moose, Rabbit, Rat, and Reptile tribes. Each of these tribes lives separately to each other and consists of several species. For example, the Ape tribe consists of the Chimpanzees, Gorillas, and Orangutans, whilst Rabbits and Hares are part of the Rabbit tribe. Maintaining near constant surveillance on the tribes are the robotic Watchers—Creepers, the spider-like service drones, the airborne Drones, and tracked and armed Sentinels being the most common—which set up roadblocks, carry out raids, track the inhabitants, and even abduct the animals for experimentation in the near mythic Labyrinth under the valley. This is done, to varying degrees, with the complicit acceptance of the tribes to whom the existence of humanity has faded into myth. For example, many of the tribes are riddled with informants who work the watchers, whilst the Dog tribe readily accepts and supports the activities of the Watchers, whilst the Rabbit tribe is at all but open war with the robots and their unknown master. Between them, with cells established throughout Paradise Valley and the tribes is the Resistance. This loose organisation seeks to overthrow the Watchers and perhaps escape the confines of the valley. The default set-up in Mutant: Genlab Alpha and ‘Escape from Paradise’ is that the player character are inhabitants of Paradise Valley, the members of one or more tribes. At least one of their number is a member of the Resistance and the likelihood is that the other player characters will quickly follow suit as the events of the campaign play out. These are built around a series of key events—abductions by the Watchers, searching for a means to counter the Watchers, discovering some of the secrets of the Labyrinth, and more—ultimately coming to a climax in an assault on the Watchers’ base and revelations as to the true nature of Paradise Valley. The campaign is supported by both descriptions and mechanics. The mechanics track the growth and activities of the insurgency conducted by the Resistance and how the Watchers react to its activities. Where in Mutant: Year Zero the player characters conduct an Assembly prior to their adventures to determine what their tribe will do and what technology they will develop, in Mutant: Genlab Alpha, the player characters and the Game Master carry out a Strategic Turn to determine what the Resistance and the Watchers do, and what the outcome will be. This is in addition to the effects of the player character operations. The Strategic Turn roughly reflects a month or so at game time, but the Game Master is free to increase or decrease its frequency to adjust the speed of the campaign as necessary. The description details five of the valley’s nine tribes and their homes, as well as the Labyrinth—or Genlab Alpha—and ultimately, what happens after the player characters and the Resistance have been successful and the surviving animal tribes escape into the Zone of Mutant: Year Zero and make contact with the surviving humanity. Some further possibilities are explored in the supplement, Mutant: Year Zero Zone Compendium 3: Die, Meat-Eater, Die!. In Mutant: GenLab, the player characters are not mutants, but animals. Anthropomorphic animals who have been altered and uplifted to be able to speak, read, and use tools. Some may have Mutant powers just as those that live in the Zone far beyond Paradise Valley, for the Rot that sickens and mutates those that come into contact with it can be found in the valley just as it pervades the Zone. (If a player character decides to have a mutant power, then the Game Master will need access to Mutant: Year Zero as none are given in Mutant: Genlab Alpha.) Most though, are not mutants, for the tribes treat such creatures as ‘tainted’ and mistrust them. Instead each animal must constantly contend with their true feral nature that threatens to overwhelm their newly created intelligence and reasoning. Each species has certain abilities, be it the Amphibian power of the Reptile tribe that lets them fight and breath underwater; the Flight Response of the Rabbit, Rat, and Moose tribes to move away from danger; or the Warning Call of the Ape and Dog tribes, which allows them to pass on a simple message with a bark or a howl. Each time an animal uses one of these Feral Powers, there is the chance that he will give into his feral nature and run away and hide. An animal lost this way must be found and healed back to its rightful intelligence. A character in Mutant: Genlab Alpha looks similar to a character from Mutant: Year Zero, but there are several differences. Obviously, a character has a tribe and a species, which determines his key attribute, his animal or feral powers, and how he regains lost Instinct. His tribe also determines his Lab name, always drawn from a certain type of famous people from the Old World, plus a two-digit number. For example, apes are named after physicists and rats after composers. That said, members of the Resistance often adopt a name other than their Lab name. Like Mutant: Year Zero, a character has four attributes—Strength, Agility, Wits and Instinct, the latter replacing Empathy from Mutant: Year Zero and representing an animal’s presence and ability to communicate silently. These are rated between one and five, as are the game’s skills. Of these, the basic skills of Comprehend, Endure, Force, Fight, Heal, Move, Scout, Sense Emotion, Shoot, and Sneak are the same as in Mutant: Year Zero. Know Nature, essentially knowledge of Paradise Valley, replaces Know the Zone, whilst Dominate replaces Manipulate. The latter is an important difference, because where humans lie, flatter, and manipulate, animals simply pull rank and dominate. Each animal also has a Rank rating, reflecting their place in their tribe’s hierarchy. Also, Dominate rolls are a means to gain Experience Points if successfully made against NPCs of a greater Rank. Each player character also has a role, each with an associated special skill and talents. These are Healer, Hunter, Scavenger, Seer, and Warrior. Each Role also gives options for determining a character’s relationships to the other player characters and NPCs, his Big Dream, and his Gear. Actually creating a character involves selecting a Tribe and Species, a Role, and Lab name. A character’s age will determine how many points a player has to assign to attributes and skills. The player chooses one Talent from those available for his Role and two Animal Powers from those available for his Species. Age and Role determines his starting Rank, whilst the player should select his character’s relationships and Big Dream from his Role. Elway 07 is a member of the Rabbit tribe, the most militant tribe in Paradise Valley. He has dreamed of the tribe finding a true home far away, though he does not know where. He wants to find where it is and believes that he must start his search in the valley. He is thus ready to leave the tribe for the first time and go on his first quest. Edwards 24 (PC) will die soon. You better remind him. All the time. Feynman 18 (PC) should have performed a heroic deed by now. What is he waiting for? Spielberg 41 (PC) is strong enough to carry you when you are exhausted. A Seer needs her rest. Octavia 13 (PC) seems to doubt your divinations. How rude! You hate… The Seer, Marino 13, whose divinations are always the opposite of yours. You want to protect… The Hunter, Mahler 17, who supplies you with food and water. To find the new and safe haven for the tribe that you have seen in your visions. Mechanically, Mutant: Genlab Alpha uses the same system as Mutant: Year Zero—a mix of specialised dice and cards, also published by Free League Publishing and Modiphius Entertainment. The content of cards though, representing Animal Powers, Artifacts, and Threats are reproduced in the pages of Mutant: Genlab Alpha and so are not absolutely necessary to play game. The dice are another matter. All six-sided dice, they are divided into three types—the yellow Base dice, the green Skill dice, and the black Gear dice. In addition to the number six all dice are marked with the radiation symbol on that face. This indicates a success when rolled. On the 1 face of the yellow Base dice there is a biohazard symbol, whilst on the 1 face of the black Gear dice, there is an explosion symbol. Rolling either symbol is counted as a failure. The green Skill dice do not have an extra symbol of their 1 faces. Now a game of Mutant: Genlab Alpha can be run without using the specific Mutant: Year Zero dice, but it does at least require pools of the three different coloured dice to represent the Base, Gear, and Skill dice. To undertake an action, a character assembles a dice pool consisting of Base, Gear, and Skill dice. These should be yellow Base dice equal to the attribute used, black Gear dice equal to the Bonus for the item of any Gear used, and green Skill dice equal to his skill. A roll of six on any of the dice rolled counts as a success, but rolling more successes are better as these can be spent on stunts. The types of stunt available are listed skill by skill. So with the Fight skill, you might inflict extra damage, grab an opponent’s weapon, or knock him over, while with Comprehend, you would not only work out how how an artefact works, you could teach others too. If no sixes are rolled, then the action is a failure. The results are even worse if ones or biohazard symbols on the yellow Base dice or explosion symbols on the black Gear dice are rolled. Each biohazard rolled inflicts a point of trauma on the associated attribute, but also generates a Feral Point that can be used to activate a character’s Animal Powers. Each explosion rolled causes the gear used to degrade and so reduces the Bonus it provides on future actions, until repaired that is. If a character fails to roll any radiation symbols—or not enough, he can push the roll and reroll any dice that did came up as Biohazard, Explosion, or Radiation symbols. Once a character has Feral Points, his player can spend them to activate the character’s animal powers. This requires a dice roll and there is the chance that a character might go feral instead of using a power. If this happens, there is also the possibility, that a new animal power might be unlocked. As in Mutant: Year Zero, combat in Mutant: Genlab Alpha is quick and nasty. A character can perform either an action and a maneuvre or two maneuvres each turn. An Action is anything that requires a skill roll or activation of a Mutation, whereas a maneuvre covers anything else that might do—move, dive for cover, draw a weapon, aim a gun, reload a gun, and so on. Trauma, whether from being attacked or intimidated, or when Pushing a roll, comes in four types each of which decreases one of a character’s attributes. So Damage decreases Strength and can inflict critical injuries, Fatigue decreases Agility, Confusion decreases Wits, and Doubt decreases Instinct, which essentially means that Damage and Fatigue covers physical trauma and Confusion and Doubt covers social and mental trauma. When an attribute is reduced to zero, then a character is broken and cannot use skills, perform actions, or activate mutations. A broken character can be killed with a coup de grâce. As well as progressing in the ‘Escape from Paradise’, player characters can also earn Experience Points, a character needing to have accrued five into order to improve a skill or acquire a new talent. Experience Points are earned in several ways. These include simple participation in a session; sacrificing something for the Resistance or the tribe; or risking something for a favourite NPC or player character, to undermine or thwart a loathed NPC, or for a character’s Big Dream. The Game Master has the final say in how many points are awarded, but it involves discussion beforehand by the players. The end of a session or adventure is also an opportunity for a character to reevaluate his relationships and his Big Dream. In addition, a character’s Rank in a tribe may rise according to his actions during the previous adventure. Physically, Mutant: Genlab Alpha is an impressive looking book. Done in full colour, the artwork is excellent and very much sets the tone for the campaign. This is grim, after all, the animals are fenced in, watched, and sometimes experimented upon, but also with a slight comedic touch. After all, these are animals doing things that would not normally do—skiing, lounging and smoking on a sofa, listening to a gramophone, and so on. Yet, Mutant: Genlab Alpha is a not a game to be played for pure laughs. The book even warns against this. Any humour present is sardonic at most, for neither the setting nor the campaign never let the Game Master or the players forget the grim nature of the animals’ predicament. That said, an issue with the artwork is that it does show a lot of the animals smoking. That may be a satire on the labtests conducted on animals of old, but it leaves the reader to wonder where the inexhaustible supply of cigarettes is to be found in Paradise Valley. The maps are also good, especially the one depicting Paradise Valley placed inside the front and back cover. Although the contents of the campaign could have been slightly better organised, the writing is good throughout and is light enough to make Mutant: Genlab Alpha accessible and easy to run. Mutant: Year Zero and Mutant: Genlab Alpha both deal with community and secrets. In Mutant: Year Zero, the mutants are leaving the community of the Ark to discover the secrets of the outside world in the Zone and return with the means to improve their community. In Mutant: Genlab Alpha, the animals know where their communities (or tribes) are and know that the threat they face stands on their doorstep and sometimes within their homes. Uncovering the secrets associated with this threat is the key to the animals eventually escaping their confinement. In addition, where the mutants of Mutant: Year Zero must contend with the dangers of what they are becoming or mutating into, the animals in Mutant: Genlab Alpha must contend with their inner nature, with the base creatures they once were. The clash between the animals and the mutants lends itself to some interesting roleplaying situations once the animals escape Paradise Valley and enter the Zone. If there is a real issue to Mutant: Genlab Alpha it is perhaps that the ‘Escape from Paradise’ campaign is all too short and quickly escalates as the player characters get involved. What it needs is more scenarios to set up the situation at the beginning of the campaign, to establish both the normality of the tribes’ situation and the player characters with the knowledge of Paradise Valley. The encounter tables included in Mutant: Genlab Alpha will help the Game Master towards that end, but a supplement adding extra scenarios would be a nice addition. Mutant: Genlab Alpha works well as a supplement to Mutant: Year Zero as it does a standalone book. The campaign is perhaps a little short and the focus upon the campaign and the enclosed nature of the campaign means that Mutant: Genlab Alpha does not offer as much game play as Mutant: Year Zero does. Yet, what Mutant: Mutant: Genlab Alpha does offer, a grim campaign and setting and expanded character options, is engaging and accessible, just as with Mutant: Year Zero.